No vehicle in the last five years has created more likes, comments, engagement and divided opinion more than Mercedes’ X-Class bakkie. Initially, the decision to slap a fancier badge on a "Nissan Navara" didn’t go down too well with 4x4 enthusiasts, motoring media and the general Joe Public. 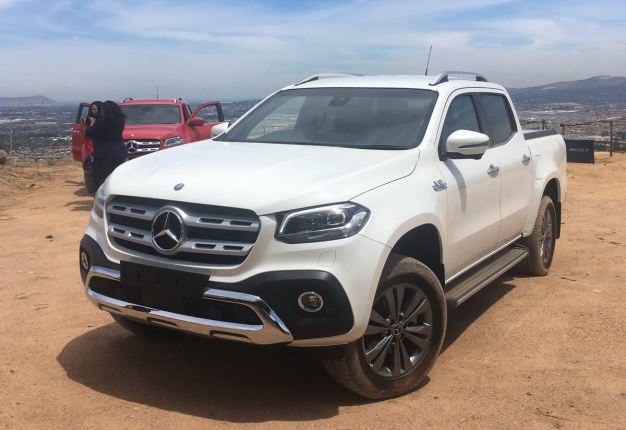 To create more buzz that ultimately turns into sales… Mercedes has released its X-Class with a V6 engine turbodiesel engine, Sean Parker drove it in the Western Cape. What’s the new engine all about? The addition of a V6 engine to the X-Class was always on the cards, and boy was it needed. It’s a 3.0-litre engine mated to a 7-speed automatic gearbox. Power output is a claimed 190kw and maximum torque is quoted at 550Nm. It has permanent all-wheel drive and is fitted with dynamic drive select, which gives the driver the choice of a few driving modes, including comfort, eco, sport (engine becomes more responsive and gearbox holds a gear for a long time), manual and finally, off-road. Mercedes says this model will reach 100km/h from standstill in a smidgen under eight seconds. When sampled at the launch it showed it has enough gusto to overtake traffic and in-gear acceleration felt swift. Merc says the 550Nm is available as low down as 1400r/min to 3200r/min. I had no issues with the performance of the gearbox: It changed down when it needed to and hauled the 2.3-ton vehicle with aplomb. It's a refined engine that loves to be pushed and averaged around 12-litres per 100km. According to Mercedes, it has the highest ground clearance of any bakkie on sale in Mzansi at a whopping 222mm. Add that to the fact that it can navigate water crossings 600mm deep and makes mincemeat of inclines of close to 50 degrees. I put the X350d through its paces on a few obstacles on an off-road course and with 4L (four-wheel drive and low range) engaged. It performed well off the beaten track but to be honest, the course wasn't monstrously difficult to deal with. The latest edition to the Mercedes-Benz X-Class range, the X350d , seen in action at its local launch in the Western Cape. It has 190kW and 550Nm from its 3.0-litre turbodiesel. I also don't think X-Class owners would risk scratching their bakkies on this type of course but it's good to know it's capable of handling tough off-road terrain. Can it be chucked about along bends? A section of the driving route took us onto the famous Franschhoek Pass, quite a bold move I felt for a vehicle of this type. The X350d impressed with less body roll than I expected. Mercedes reckons this comes down to its wider track when compared to the four-cylinder-powered models. The X350d is 1632mm wide in the front and 1625mm at the rear. Coupled with that with the anti-roll bar which reduces body roll according to the automaker. The suspension is fitted with coils springs to the axle for a more comfort bias to the suspension. I tried out sports mode, via the dynamic select button, when tackling Franschhoek Pass. As mentioned, it alters the engine response and holds gears a bit longer to eke the most power of out of the revs. Unfortunately, the steering doesn't become heavier when sports mode is engaged. And it does suffer from a lot of play. As a machine, the X350d ticks the proverbial boxes of a compliant ride, off-roading ability and premium exterior styling with the three-pointed star sitting front and centre. Some buyers expecting S-Class levels of comfort, might be disappointed by the quality of interior materials. Our test unit was fitted with a faux wood finish on the dash and the buttons just don't seem fitting for a vehicle retailing for more than R900 000. The Progressive model, which costs R904 188, features 17-inch wheels, air vents finished in silver chrome, a steering wheel and parking brake lined with leather and an eight-speaker sound system. The Power model, retailing at R973 188, adds 18-inch wheels, LED headlamps, electrically adjustable seats, and the infotainment system Audio 20 with a multi-functional touchpad. The V6-powered model is a massive improvement over the X220d and X250d models. It feels more like a Mercedes should but it is let down, at least for its pricing, by a sub-standard interior. Local buyers of an X-Class are after the prestige offered by driving a vehicle with a three-pointed star on the hood. And through the myriad of Hiluxes and Rangers on the road, the X-Class will do what it's meant to do: Stand out.